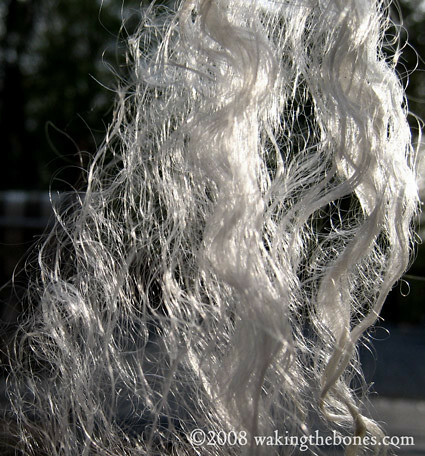 I have become enchanted by fiber. Utterly, completely ensorcelled. Mesmerized by mohair, lured by llama, beguiled by bamboo, conned by cashmere, won by wool. 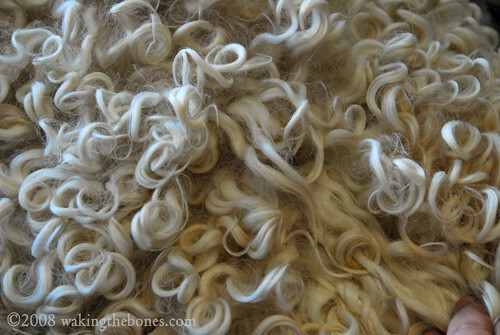 Even when I am sorting through a poorly shorn or sloppily skirted fleece, audibly bemoaning the profusion of too-short-to-use second cuts, complaining about the multitude of friable, sunburned tips, deploring the way-too-nasty-to-clean giant dung tags I have to snip out and drop, somehow without touching them, into the compost bag, I do so with undertones of awe. Has the rich smell wafting off a dripping-with-lanolin Border Leicester lamb fleece clouded my wit? The glistening, starry midnight of the downy thel, (undercoat) of a black Icelandic bedazzled my common sense? 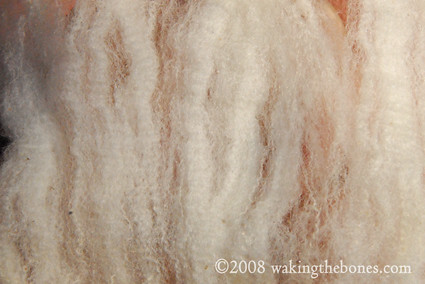 The indescribable satiny-softness of Kid Mohair abducted my intelligence? The luminous, rich colors of hand-dyed Bombyx Silk blinded my judgment? Perhaps, all of the above. And this: what slips through my fingers as I wash and card and spin is not wool, or alpaca, or linen. It is energy on the brink of transformation. It is the art-i-fact of some animal or plant's cycle of growth. It is a part of the Life-force that is about to become clothing or craft. It is a gift from Nature. It is Food for the Soul. Oh my what is that first photo? I love those locks! Aren't they luscious? 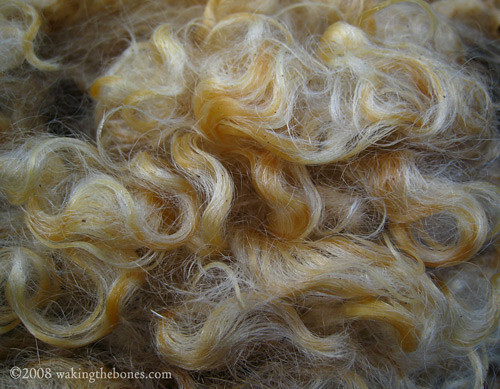 They are Cotswold locks—same as the sheep I posted under "Dreads"
Your wonderful posts keep getting better and better! Your photos are rich and deep, and your writing is a soothing balm for my soul. As in: You're the Balm!! Keep up the beautiful work.